Cardiff City moved off the bottom of the table after recording their first win of the Premier League season with a 4-2 home victory over Fulham, writes Sky Sports. Andre Schurrle opened the scoring for the visitors after just 11 minutes with a stunning 30-yard strike, only for Cardiff to hit back with two goals in quick succession. Josh Murphy firstly levelled matters with a neat finish on the quarter-hour mark, before the recalled Bobby Reid gave the home side the lead just five minutes later. In a ding-dong first half, though, Ryan Sessegnon equalised for Fulham 11 minutes before the break with his first Premier League goal. However, Neil Warnock's team would not be denied as second-half strikes from Callum Paterson (65) and substitute Kadeem Harris (87) gave the hosts a much-needed three points. As a result, Cardiff moved above their opponents and up to 17th in the table, while Fulham dropped to 18th having now conceded a league-high 25 goals this campaign. With both sides in desperate need of a win, it was no real surprise that the first 45 minutes produced four goals in South Wales, the first a wonder strike from Schurrle. 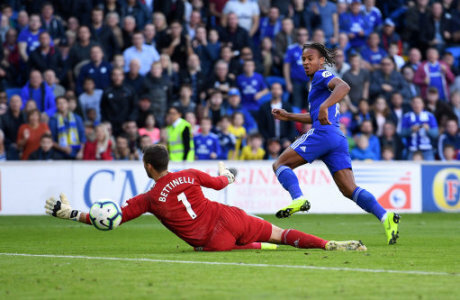 The German was given far too much time and space to size up his options, although he still had work to do to beat Cardiff goalkeeper Neil Etheridge with a long-range effort that flew into the top right-hand corner of the net. Cardiff responded to that early setback, though, as Murphy latched on to Sol Bamba's ball down the left channel, before powering into the box and beating Marcus Bettinelli with a low shot into the far corner of the net, albeit with the help of a slight deflection. The hosts were soon ahead after Schurrle got caught in possession just outside his box, before Reid was slipped through on goal, with the forward doing well to slide the ball under the advancing Bettinelli. It was not long before Fulham got back on level terms as the visitors caught Cardiff out with a quick free-kick, before Aleksandar Mitrovic's lovely backheel released Sessegnon, who kept his cool to become the first player born in 2000 to score a Premier League goal. 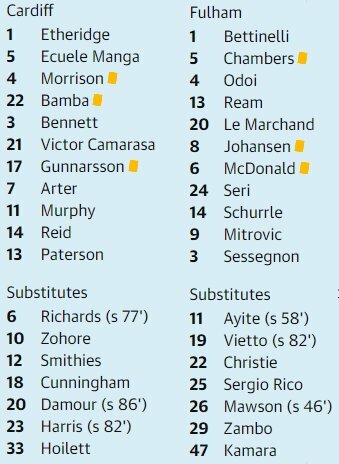 But it was Cardiff who claimed all three points, with Paterson grabbing their crucial third goal midway through the second half after neat build-up play down the right between Aron Gunnarsson and Bruno Ecuele Manga. The marauding right-back centred low into the box and Paterson swivelled before finding the bottom corner of the net, with Harris then sealing the win late on after good perseverance by Victor Camarasa.